کاردگر, امین, مظاهری بادی, کیومرث. (1392). بررسی تاثیر قطر و رطوبت ذرات در احتراق سوخت مشتق شده از زباله‌ها (RDF). نشریه پژوهشی مهندسی مکانیک ایران, 15(2), 78-97. امین کاردگر; کیومرث مظاهری بادی. "بررسی تاثیر قطر و رطوبت ذرات در احتراق سوخت مشتق شده از زباله‌ها (RDF)". نشریه پژوهشی مهندسی مکانیک ایران, 15, 2, 1392, 78-97. کاردگر, امین, مظاهری بادی, کیومرث. (1392). 'بررسی تاثیر قطر و رطوبت ذرات در احتراق سوخت مشتق شده از زباله‌ها (RDF)', نشریه پژوهشی مهندسی مکانیک ایران, 15(2), pp. 78-97. کاردگر, امین, مظاهری بادی, کیومرث. بررسی تاثیر قطر و رطوبت ذرات در احتراق سوخت مشتق شده از زباله‌ها (RDF). نشریه پژوهشی مهندسی مکانیک ایران, 1392; 15(2): 78-97. با استفاده از نرم افزار فلوئنت، احتراق سوخت مشتق شده از زباله در یک کوره شبیه­سازی و نتایج حاصل با استفاده از داده­های آزمایشگاهی صحت­سنجی شده است. به دلیل دو فازی بودن جریان از مدل اویلری برای شبیه­سازی میدان سیال و از مدل لاگرانژی برای دنبال کردن ذرات سوخت مشتق شده از زباله استفاده شده است. برای مدل­سازی فرآیند آزاد شدن گازهای فرار و احتراق مواد نیم سوز به ترتیب از مدل سینتیک تک نرخی و مدل نفوذ-سینتیک استفاده شد. برای شبیه­سازی جریان سیال از معادلات متوسط­گیری شده نویر-استوکس و برای مدل سازی تنش رینولدز از مدل k-ε استاندارد استفاده شده است. قطر و رطوبت ذرات یکی از پارامترهای مهم در احتراق سوخت های می­باشد. با بررسی قطرهای مختلف مشاهده شد که با افزایش قطر ذرات سوخت مشتق شده از زباله بیشینه دما کاهش یافته و ناحیه دما بالا از ورودی فاصله می­گیرد. همچنین با افزایش رطوبت ذرات مشاهده شد که ماکزیمم دما در کوره کاهش می­یابد. Liakos, H. H., Thoelogos, K. N., Boundovis, A. G., and Markatos, N. C., “Pulverized Coal Char Combustion: The Effect of Particle Size on Burner Performance”, Applied Thermal Engineering, Vol. 18, No. 11, pp. 981-989, (1998). Weber, R., Kupka, T., and Zając, K., “Jet Flames of a Refuse Derived Fuel”, Combustion and Flame, Vol. 156, No. 4, pp. 922-927, Apr. (2009). Pallares, J., Gil, A., Cortes, C., and Herce, C., “Numerical Study of Co-ﬁring Coal and Cynara Cardunculus in a 350 MWe Utility Boiler”, Fuel Processing Technology, Vol. 90, No. 10, pp. 1207-1213, (2009). Yin, C., Kær, S. K., Rosendahl, L., and Hvid, S. L., “Co-ﬁring Straw with Coal in a Swirl-stabilized Dual-feed Burner: Modeling and Experimental Validation”, Bioresource Technology, Vol. 101, No. 11, pp. 4169–4178, (2010). Agraniotis, M., Nikolopoulos, N., Grammelis, P., and Kakaras, E., “Numerical Investigation of Solid Recovered Fuels’ Co-ﬁring with Brown Coal in Large Scale Boilers-evaluation of Different Co-combustion Modes”, Fuel, Vol. 89, No. 12, pp. 3693–3709, (2010). Lu, H., Ip, E., Scott, J., Foster, P., Vickers, M., and Baxter, L. L., “Effects of Particle Shape and Size on Devolatilization of Biomass Particle”, Fuel, Vol. 89, No. 5, pp. 1156–1168, (2010). Gubba, S. R., Ma L., Pourkashanian M., and Williams, A., “Inﬂuence of Particle Shape and Internal Thermal Gradients of Biomass Particles on Pulverised Coal/Biomass Co-ﬁred Fames”, Fuel Processing Technology, Vol. 92, No. 11, pp. 2185 –2195, (2011). Shirolkar, J. S., Coimbra, C. F. M., and McQuay, M. Q., “Fundemental Aspect of Modeling Turbulent Particle Dispersion in Dilute Flows”, Progress in Energy and Combustion Science, Vol. 22, No. 4, pp. 363-399, (1996). Poinsot, T., and Veynante, D., “Theoretical and Numerical Combustion”, 2nd ed. R.T. Edwards, Inc, pp. 540-, (2005). 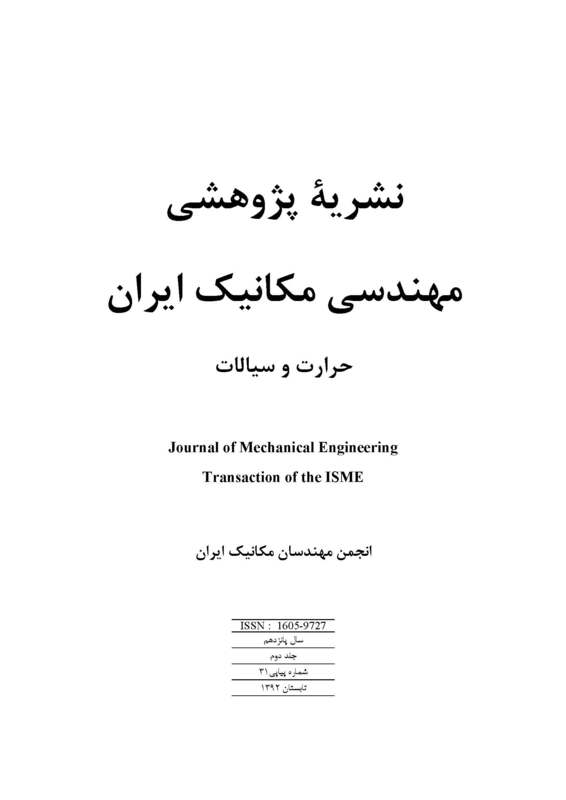 Ettouati, H., Boutoub, A., and Benticha, H., “Radiative Heat Transfer in Pulverized Coal Combustion: Eﬀects of Gas and Particles Distributions”, Turkish Journal of Engineering & Environmental Sciences, Vol. 31, pp. 345-353, (2007). Magnussen, B. F., and Hjertager, B. H., “On Mathematical Models of Turbulent Combustion with Special Emphasis on Soot Formation and Combustion”, Symposium (International) on Combustion, Vol. 16, No. 1, pp. 719–729, (1976). Williams, A., Jones, J. M., Ma, L., and Pourkashanian, M., “Pollutants From the Combustion of Solid Biomass Fuels”, Progress in Energy and Combustion Science, Vol. 38, No. 2, pp. 113-137, (2012). Fluent Inc, Fluent 6.3.26 User's Guide, (2006). Incropera, F. P., and DeWitt, D. P., “Introduction to Heat Transfer”, 4th ed. Wiley, pp. 912-, (2001). Badzioch, S., and Hawksley, P. G. W., “Kinetics of Thermal Decomposition of Pulverized Coal Particles”, Industrial & Engineering Chemistry Process Design and Development, Vol. 9, No. 4, pp. 521-530, (1970). Agraniotis, M., “Coal Substitution of Alternative and Support in Fuel Boilers for Pulverized Fuel CO2 Emission Reduction”, Ph.D. Thesis, National Technical University of Athens, (2010). Field, M. A., “Rate of Combustion of Size-graded Fractions of Char from a Low Rank Coal Between 1200 K–2000 K”, Combustion and Flame, Vol. 13, No. 3, pp. 237–252, (1969).